A delicious breakfast or brunch dish, this is also hearty enough for dinner. Place cast-iron skillet in oven and turn oven on to 450° F. Allow skillet to heat in the oven until oven is at least pre-heated and if possible, a little longer. Meanwhile, blend eggs in blender until very frothy. With motor running, gradually ad milk, then cooled melted butter. Blend for 30 seconds. Add flour, cornstarch, salt and pepper. Mix until well combined. Leave in blender until needed. In a large skillet on stove-top over medium heat, cook bacon until crispy. Remove to a paper towel. Remove all but a couple of teaspoons of the bacon fat from the pan. Add onions and cook until softened. Sprinkle kale over-top and stir for 30 seconds or so. Turn heat off under pan, but let pan sit on stove-top until needed. When skillet is good and hot, remove from oven. If batter has been sitting, give it a quick mix with the blender. Add 1 Tbsp. butter to the hot skillet and swirl it around to coat. Scatter cheese cubes in skillet, then immediately pour batter in to pan and quickly place in the hot oven. 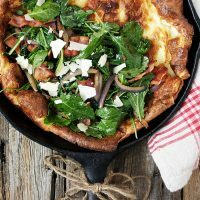 Cook Dutch baby for 16-20 minutes, or until puffy and golden brown. When Dutch baby is almost done, crumble bacon in to skillet with kale and turn heat on under skillet to low and stir well, to warm and finish wilting the kale. When Dutch baby is out of the oven, allow to sit a minute or so, until it deflates, then top with kale/bacon mixture. Top with a bit of shaved aged cheddar, if desired.